Is Royal Portrush the head of Northern Ireland golf's class? Home to Calamity and Big Bertha, Royal Portrush Golf Club's Dunluce Links is one of the finest walks in links golf and perhaps the best golf course in Northern Ireland. PORTRUSH, Northern Ireland - The electricity hits your nerves well before you tee it up at Royal Portrush Golf Club's No. 1. Heading north on Northern Ireland's A1 coastal route, you skirt rocky cliffs past natural wonders like the Giant's Causeway. The ruins of 13th-century Dunluce Castle rear into view, sitting so delicately above the sea it's a wonder the whole thing hasn't fallen in (the kitchen did one night in 1639, killing all the cooks). Then the links hit you. Or do they? All you see from the road is a few hundred acres of massive green and yellow dunes. The mighty Curran Strand, a long, towering formation, shields some of the land from the sea. The tiny islands known as the Skerries sit just off shore. So are framed the Dunluce Links at Royal Portrush - a 19th-century course that's among the finest you'll ever walk. The only Emerald Isle golf course to host the British Open (in 1951) and the home club of the only Irishman to win the Open (Fred Daly in 1947), Royal Portrush was founded in 1888 but owes its current form to a 1947 redesign by H.S. Colt (with an assist from George Crump). The links is named for the ruined castle a few miles away, which can be seen frequently during the round, most notably from the beautifully situated fifth green overlooking the sea. That dream view gives way to nightmares like the par-3 14th, aka Calamity, a slicer's bane with one of the most intimidating tee shots in golf: 215 yards (from the championship tees) to a green perched over a deep abyss of tall brush to the right. "A lot of members will hit it down there, be able to see the ball and still not bother to go get it," Head Professional Gary McNeil noted. Tempting as it may be to go for a pin in the center or right of the green, play to the left by any means necessary. At the 1951 Open Bobby Locke made par all four days by going up and down from a swale to the left of the green, a little depression known ever since as "Bobby Locke's Hole." Then there's the No. 17, a flat number that would seem unassuming if not for one massive obstacle: Big Bertha, the biggest bunker in Ireland. Famous pictures show poor golfers who find the sand dwarfed by Bertha's monstrosity. You'll do just fine playing far to the left of it. 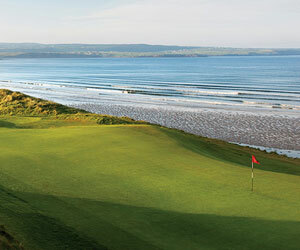 The Dunluce Links is one of Ireland most scenic, historic golf courses. It starts and finishes relatively bland, and a sprawling trailer park to the right of the first hole is a bit of an eyesore. But from No. 4 to No. 15, this is as good as links golf gets. Debate rages as to whether this or Royal County Down represents Northern Ireland golf's best. You can make a convincing argument for Royal Portrush: It's friendlier for the mid-handicapper, and £15-£25 cheaper any given day, with green fees ranging from £110 to £125. The club's Valley Links was laid out by Colt around the time of his Dunluce Links upgrade. Contrary to many clubs' second-fiddle "wee" or ladies' courses, the Valley holds its own at 6,304 yards. Playing mostly below Dunluce (many holes are sub-sea level), it's a good "solid second," and much easier on the wallet (£35-£40 for 18 holes). Portrush is a hopping little seaside town and one of the Northern Ireland countryside's best nightlife hubs. The Ramada Portrush is a stylish modern hotel within walking distance of all the restaurants and pubs you'll need. If you're staying further south, try the Slieve Donard Hotel in Newcastle next to Royal County Down or the Roe Park Radisson resort in Limavady. Royal Portrush's clubhouse has a second-floor bar and restaurant that overlooks the links. Portrush town overachieves for its size in the culinary category, with plenty of casual pubs and fine-dining options. Royal Portrush was so named in 1895, seven years after it opened. It was originally called the Country Club, then became the Royal Country Club in honor of its then-patron, the Duke of York. Why was the Open played at Royal Portrush in 1951 and why has it never gone back there? I was particularly impressed with how people shared their experiences so openly without plugging their own agenda – a true example of an effective knowledge society.